Living Art Farnham now has its first piece of living art, thanks to our latest project. This 4m x 1m living art system has been bespoke made for one of our clients, it has its own irrigation (self-watering system) and a range of plants that provide all year round interest. 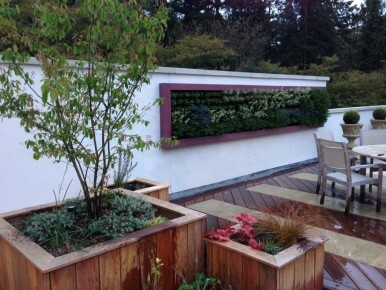 This living art complements and provides the finishing touch to a recently completed roof garden. A Peice of living art brings the wall to life. Creating a green space in a vertical situation. Not only do they look better that a plane wall, but they keep buildings warmer in the winter and cooler in the summer. They offer habitats for wildlife and allow for more pleasant surrounds in a city landscape. They are also reported to reduce pollution although this is not proven at this point.